Cologne - Every country has its own great footballing derbies, from Spain's El Clásico to the Derby della Madonnina in Milan. Yet one that arguably trumps the lot is Germany's Revierderby between Ruhr neighbours Borussia Dortmund and FC Schalke 04. Dating back to 1925, it's a contest steeped in tradition, regional politics and fierce local pride - ingredients set to go into the mix once again on Matchday 6 - but not before bundesliga.com looks back on some of the most memorable Ruhr rumbles so far. Dortmund took eight of the first ten derby dates of the Bundesliga era, before die Knappen finally struck gold on 20 April 1968 with their first win over Dortmund since 7 September 1963. Another Schalke success on 4 March 1972 proved an even bitterer pill to swallow for Dortmund, whose subsequent relegation ensured it would be another three years before the Ruhr powerhouses could renew acquaintances. True to form, it was Dortmund who restored Kohlenpott order upon their return to the top-flight as Lothar Hubner gave Dortmund their first victory over Schalke in nearly ten years on 5 November 1977. However, it wasn't until August 1991 that the real fireworks between the two began. Returning to the Bundesliga after their 1987/88 relegation, Schalke and former Dortmund midfielder Ingo Anderbrügge set the tone with the opening goal at the the former's old Parkstadion home just two minutes into the August 1991 tie. Dortmund managed to draw level before half-time, but were left reeling after the restart as the Royal Blues cruised to a stunning 5-2 win, with Dortmund ultimately losing out in the title race to eventual Bundesliga winners VfB Stuttgart on goal difference. Schalke, or rather goalkeeper Jens Lehmann, would steal the headlines yet again on 19 December 1997 when the former Germany international rose to head home in the 90th minute in a thrilling 2-2 draw, in the process becoming the first-ever goalkeeper in the Bundesliga to score an outfield goal. Dortmund were then served a wicked dose of déjà vu seven years later, courtesy of Ebbe Sand's last-gasp strike on Dortmund soil in December 2004. Dortmund would have their revenge, though, ending Schalke's 12-match unbeaten Revierderby run in front of 61,500 fans at the Gelsenkirchen Arena on 14 May 2005. Sebastian Kehl and Lars Ricken netted in the 2-1 win, but Dortmund's next victorious effort would taste even sweeter in what became known as the 'Mother of all Derbies'. On the penultimate day of the 2006/07 season, Schalke went into the Revier clash as league leaders, a point clear of second-placed Stuttgart. 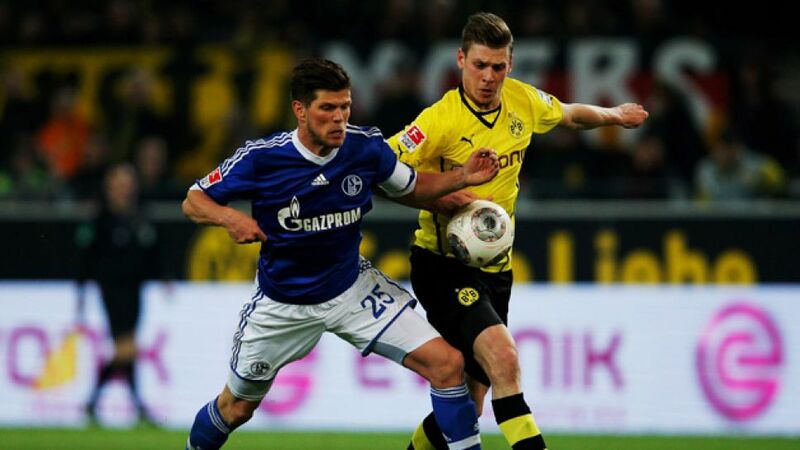 The Swabians won their Matchday 33 encounter in Bochum, but Schalke went down at the Signal-Iduna-Park with Alexander Frei and Euzebiusz 'Ebe' Smolarek the party poopers. Frei was again the chief culprit on 13 September 2008, grabbing a second-half brace as Schalke squandered a 3-0 lead on Dortmund's own patch in a game that remarkably ended 3-3. Jürgen Klopp's Dortmund effectively cleaned house in the Ruhr en route to back-to-back titles in 2010/11 and 2011/12, but in another twist of fate, the Royal Blues completed a rare Bundesliga double over their Schwarz-Gelben nemesis in 2012/13, battling to a 2-1 win at the Signal Iduna Park on Matchday 8, before completing the trick, again to the tune of 2-1, on home turf on 13 March 2013. Last season saw Dortmund regain the upper hand, winning 3-1 on their neighbours' own patch before the two sides shared a goalless draw at the Signal Iduna. In the most recent fixture between the two great rivals in September, an Eric Maxim Choupo-Moting double earned die Knappen a 2-1 victory at the Veltins Arena.